Think of it as an address for each electron within an atom. Just as a stadium has seating chart, separating various sections, so does an atom. A ticket will help identify the section, row, and seat that of each spectator, specifically. Imagine finding your seat without your ticket! Electrons are distributed throughout sections of atom much like seats in a stadium and the electron configuration acts as the ticket, giving directions to find a specific electron’s atomic address using the periodic table as the seating chart. The first value is the principle quantum number, n, which indicates the row on the periodic table. The second value, the angular momentum quantum number, l, indicates the section of the periodic table where the electron is located (s, p, d, f). Lastly, the exponent, or number of electrons spins, the magnetic spin quantum number, ms, will indicate how many blocks across that section to count in order to reach the destination electron. Knowing where electrons are located, specifically those in the valence shell, can give insight into the needs of the atom and predict its behavior. Does the atom want to lose electrons or gain electrons? What will make the atom most stable? 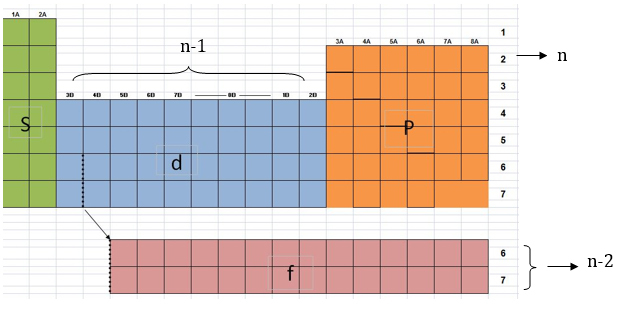 The periodic table is divided into ROWS (1-7) and SECTIONS (s, p, d, and f) while the each ELEMENT block counts as 1 electron. Note: For the “d” section, n is reduced by 1; for the “f” section, n is reduced by 2. At your starting point, first state the ROW # (1-7). Then state as an exponent how many SPACES you must move to reach the destination element. When electron configurations become too long and tedious, they are abbreviated using the symbol of the preceding Noble Gas in [ ] as the starting point and then counting off the remaining electron configuration. What about ions? They just gain or lose electrons so we adjust our exponents. If there is a cation, it has LOST electrons. If there is an anion, it has GAINED electrons. Notice that both of these ions now have 18 electrons just like the Noble Gas, Argon. Elements with the same # electrons or electron configurations are said to be isoelectronic.